Fifteen months into a deep recession, college-educated white workers still had a relatively low unemployment rate of 3.8% in March of this year. The same could not be said for African Americans with four-year degrees. 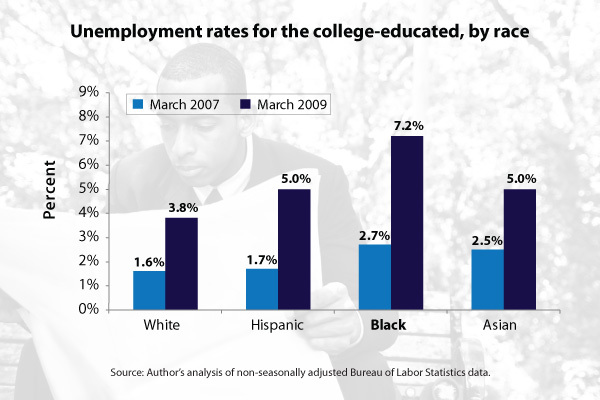 The March 2009 unemployment rate for college-educated blacks was 7.2%–almost twice as high as the white rate–and up 4.5 percentage points from March 2007, before the start of the current recession (see chart). Hispanics and Asian Americans with college degrees were in between, both with March 2009 unemployment rates of 5%. special_election_edition/why_is_the_black_male_employment_rate_so_low, for a more detailed discussion of this issue.